"Similar to the navigational suggestions, sometimes we detect that the most relevant completion for what you're typing is an ad. When an ad is shown, we mark it with the text "Sponsored Link" and a colored background, as on the results page." The updated Google Suggest will have an interesting side-effect: you'll see the search results pages less often. Google saves you a few clicks by suggesting search results directly from the homepage, much like Google Chrome's omnibox, but monetizing the suggestions seems out of place. The ads draw attention from the list of suggestions, they're unnecessarily large and they clutter the interface. Hopefully, Google won't show sponsored links in the list of suggestions very often and Google will focus on adding useful suggestions like: unit conversions, results from Google Calculator, facts etc. * I don't see the ads in Google Suggest, so maybe the feature hasn't been publicly launched yet. 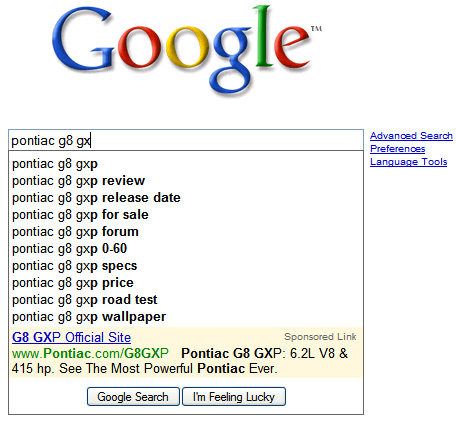 * Is this the first time when Google shows third-party ads on the homepage? google is try hard to get revenue from every single bit of its feature... hmmm recession blues.. I know that many internet users actually google website (i.e. if they want to go to twitter.com, they enter twitter in google search box). Therefore, Google can directly make money from such usages by "forcing" users to click on ads if they want to directly go to the website ? I think this is only fair. They're reducing the number of times people see the search results page, and they're bound to lose a lot of revenue because of this. (less search page views = less ads shown).